​"Your true character is revealed by the clarity of your convictions, the choices you make, and the promises you keep. Hold strongly to your principles and refuse to follow the currents of convenience. What you say and do defines who you are, and who you are, you are forever." Kari Holmberg is a certified dog trainer through the Animal Behavior College, a graduate from Red Deer College with a diploma in Business Admin and is certified in canine first aid.. Kari has a variety of experience with dogs including (but not limited to); daycare, nutrition, training, boarding, bonding, behavior, gun dog, and working dogs. Kari has recently reopened a dog daycare in Red Deer, and continues to follow her true passion of helping dogs through training, working and behavior modification. Kari's first word was 'puppy', and her love of canines has only grown from there. Growing up in the Crowsnest Pass allowed her to focus on her lifelong obsession: "When I was young, it was all I could think about! I had to find out everything and anything I could on dogs, their behavior, and of course, their well being". She currently owns three dogs of her own: Bosco (German Shepherd, 10), Ella (Black Lab, 5), and Vandal (German Shepherd, 1). 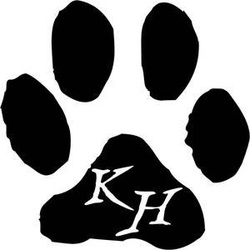 Kari is open to any and all questions regarding your furry family members "it's part of my passion. If I don't know the answer, then I will find it. That's half the fun!"